Bet Patriots +3 over Chiefs at -108 with 888Sport. Bet Chiefs-Patriots over 56 points at -110 with Betfair. Bet Tom Brady over 290.5 passing yards at -115 with Karamba. Bet Travis Kelce to score first TD at +600 with 888Sport. It should come as no surprise to NFL Conference Championships betting fans that we see the top two seeds in the AFC meeting on Sunday, especially if they were paying attention to recent history. 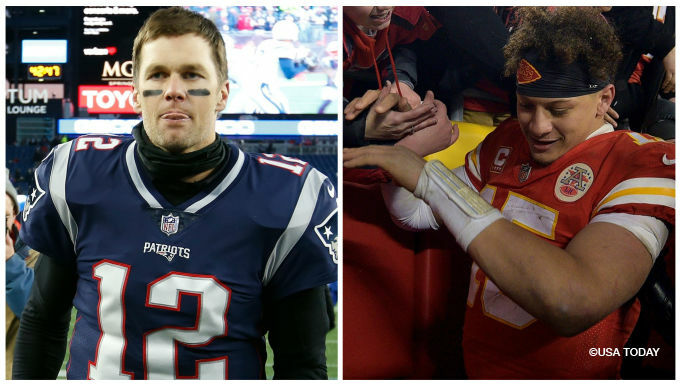 Outside of Patrick Mahomes and Tom Brady, the biggest factor on Sunday could be the arctic blast set to hit Kansas City. Both teams came off convincing wins in the NFL Divisional Playoffs, with the Chiefs handling the Colts, and the Patriots having no trouble with the Chargers. It’s rare for NFL betting fans to see Brady and Bill Belichick as “underdogs,” but it worked last year for the Eagles. However, I wouldn’t expect to see Brady in any dog mask. The line represents where the game will be played. Nothing more, nothing less. The three points the Chiefs are getting won’t be enough here, as their defense is just not consistent enough. Last weekend was an anomaly for Andy Reid’s D against Indy. They held Luck and the Colts offense to just 13 points, but more so nothing on the ground. While they do have guys like LB Justin Houston back for this game, there isn’t enough quality personnel to stop NE’s three headed rushing attack. Points may come in different ways, but KC and Mahomes want to run a track meet. The Patriots will score, match points with the Chiefs, but will do it in their own way. Much slower than the Chiefs. Kansas City lost their best RB (Kareem Hunt) earlier in the year and will now have to rely on Damian Williams for ball control. The Patriots defense can be thrown on and will be thrown on a lot. The chess match of running the ball will go to New England over Kansas City, and be the main reason why the Patriots move on to the Super Bowl. Take New England and the points with 888Sport. Make no mistake, it will be freezing on Sunday in Kansas City. Like last weekend in the snow, people thought it would limit offenses. Well it did, but not both, just the Colts. Kansas City is preparing for the coldest game ever at Arrowhead Stadium, while the Patriots are preparing for business as usual in January. Both teams put up over 30 points last week in cold outdoor stadiums; the weather won’t limit these two teams. In fact, it might make it easier for both QBs to move the ball in the air. Reid has struggled against Belichick since arriving in Kansas City and is just 2-2 against the Patriots. The game will come down to the ground and pound, but not after the two teams get some early points in the air. Bet the over at -110 with Betfair. The Patriots could be on the receiving end of a blow out, but Brady will still throw the ball. In fact, Brady hasn’t gone below that total in two years, when he had 287 yards in 2016. Before that? How about 2013 in the AFC Championship game when he only threw for 277. This is Brady’s eighth straight championship game. It would take the Patriots putting up early scores and keeping KC out of the football game for this to come close to the under. Expect Brady to hit 300+ trying to keep up with the younger Mahomes, and bet on it with Karamba. This almost seems too easy, and the payout nearly reflects it. The reality is that the Chiefs offense simply won’t work without Mahomes throwing the ball. He led the top scoring offense in the NFL at 35.1 PPG and they put up the most yards as well. While they were able to move and score consistently on the ground last week, this Patriots team is almost begging the Chiefs to throw, mainly because they can’t stop many passing offenses. The Chiefs will cross the end zone plenty of times Sunday afternoon, at least three will come from the arm of Mahomes. Bet on it with Karamba. While the Patriots will win this game as a road dog, we can expect plenty of fireworks from both teams along the way. The Chiefs present a nightmare matchup for pretty much any team in the NFL with Kelce, and New England is far from the exception. The Pats have struggled mightily in defending the deep middle of the field, and even worse in the red zone. Only three teams in the NFL gave up more TDs to tight ends this year than the Patriots. Take Kelce at +600 to score the first TD with 888Sport.